Auchrannie resort on the isle of Arran. The Auchrannie resort lies about a couple of miles along from the port of Brodick and commands a wonderful view out across the Arran countryside and towards the highest peak on the Island, Goat Fell. It is a large complex, with different types of accommodation suitable for couples, families or solo travellers. There’s a new Auchrannie ap that you can download for your phone prior to your visit which also gives you a preview of what’s on offer so you can plan ahead for your visit. The original house dates back to 1869 and has a comfortable Scottish country hotel feel. 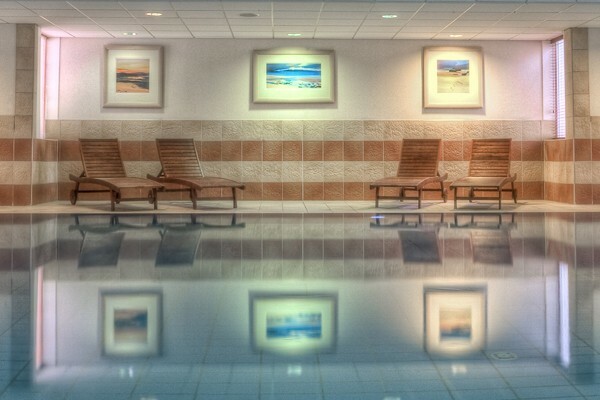 The spa resort is more modern and contemporary in style with large well equipped bedrooms and lots of optional extra space with balconies and additional lounges with access to snacks and drinks and even an outdoor hot tub, to relax in around the building. Some of the rooms have separate bunk rooms for the kids, they even have TVs built into the wall for the top and the bottom bunk! There are even thirty 5 star luxury self catering lodges situated in the grounds, to provide more privacy and autonomy if you prefer to stay with your own group. There is an in house beauty Spa – Aspa – using premium products and with a wide range of treatments available. There is also a lovely big swimming pool and a smaller children’s pool, steam room and sauna area. I had a really good swim while I was there which I very much enjoyed, and the pool wasn’t too busy either. There’s even a large sports hall, great to use indoors if its bad weather or if you perhaps feel like a game of badminton, and there are lots of other activities you can book like archery, Segways, gorge walking or mountain biking. If you want to climb up Goat Fell it takes three to four hours, but I imagine it’s a great view from the top! Auchrannie is a hotel which takes sustainability seriously. It recycles glass paper and ink cartridges, has low energy lighting, has a 300KW biomass wood chip boiler and uses fair trade products. All the produce served in the restaurant is locally sourced wherever possible, and there is even an electric car charging point. There is a choice of places to eat including the Cruize bar brasserie, Brambles seafood grill and the 1869 restaurant which services the unusual option of Scottish Tapas! We dined in the Cruize brasserie which was very nice and the staff were very friendly and attentive. It was children in need day so there were some interesting outfits on show! The food was very good indeed and the locally produced Arran ice cream is a must! We couldn’t try the 1869 restaurant as there was a power cut across part of the Island which affected the main house but we did enjoy a hot toddy made with Arran Lochcranzie whisky by candlelight, in the lounge. Robert the bar man told us his mum had taught him the recipe for the hot toddy – and the special ingredient I enquired? ‘Love’ he said. Great answer! Auchrannie is also very pet friendly. Dogs are welcome and there are lots of facilities for your VIPs (Very Important Pooches) including water bowls and VIP friendly areas. You do need to keep a check on your muddy paws though! Auchrannie was acquired by the Johnston Family in 1988 with a view to providing indoor leisure facilities on the island. In the process of achieving this objective, Auchrannie has grown from a 16 bedroom guest house to a resort now comprising two 4 star hotels with 85 rooms, thirty 5 star self-catering luxury lodges, three restaurants, a shop, two leisure clubs with pools, a destination spa, an outdoor adventure centre and a children’s ‘Playbarn’. Auchrannie remains under the ownership of the Johnston family, who continue to play an active role in the business. There is an awful lot to do at the Auchrannie resort and it certainly seemed a very popular destination when we were there. There is even a free shuttle bus down to the port if you haven’t brought a car with you. Lots of space and a range of great quality accommodation make this a top choice for any stay on this beautiful Scottish island. Elaine Wilson has been writing blogs on travel, events and accommodation for over six years and is a digital marketing expert.